This anthology celebrates ten years of poetry and prose from the road, all previously featured in Hobo Camp Review, a gathering place for the road-weary storyteller. All proceeds will go to The Food Pantries for the Capital District, a coalition of 50+ food pantries throughout the Albany, NY region. So if you buy a copy, you’ll be helping someone put hot food on their table, a yearning dream shared by every hobo traversing the lonely highways and railroad tracks criss-crossing the world, all looking for a little work, a little rest, and a home-cooked meal. And what will you get when you buy a copy? Well, Hobo Camp Review specializes in travel stories, Beat-ish poetry, something with a dark twist, or something that'll make us laugh, just so long as it has a sense of vagrancy, a little sparkle and a little dust, shadows and angles, anything that sounds good by the firelight with a train calling in the distance. Be original. Be honest. Be on the move. Remember what happens in between and tell us all about it. Welcome to the Hobo Camp, fellow transient! 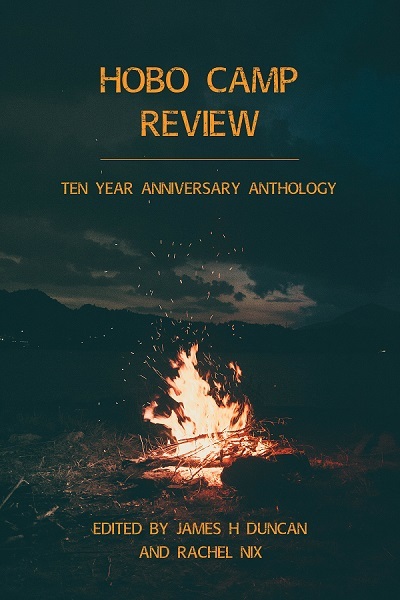 This anthology features the work of Adam Perkins, Ally Malinenko, Ann Howells, Anney E.J. Ryan, April Michelle Bratten, Bud Smith, Charles Clifford Brooks III, Charles O'Hay, Corey Mesler, David M Morton, Dena Rash Guzman, Destini Vaile, Don Thompson, Doug Draime, Edward Ferri, Jr., Emily Blair, Faith Mingus, Frank Reardon, Glen Armstrong, Gloria Keeley, Hasan Jamal, Hillary Leftwich, Holly Day, Holly Holt, J.C.D. Kerwin, Jack Henry, James H Duncan, James Murdock, Jason Ryberg, Jeffrey Alfier, Jessica Dawson, Jessica Mehta, John Tustin, Joseph Jengehino, Josh Fernandez, Joshua Ryan Wood, Kami, Kate Garrett, Kathleen Sparks, Kathryn Staublin, Kevin Ridgeway, Knar Gavin, L.L. Jacobson, Lark Beltran, Lee Ann Pingle, Lili-Leader Williams, Maria Pascauly, Mary Shanley, Mathew Borczon, Mikey Sivak, Orooj-E-Zafar, Peycho Kanev, Puma Perl, R.M. Engelhardt, Rachel Nix, Raina Masters, Rebecca Kokitus, Rebecca Schumejda, Rhiannon Thorne, Rob Plath, Rogan Kelly, Sam Slaughter, Sarah Warren, Scot Young, Scott Blackwell, Seth Murray, Shahé Mankerian, Sheikha A., Siham Karami, Stan Galloway, Suzanne Allen, Taylor Copeland, Tempest Brew, Tobi Alfier, Tom Montag, Valentina Cano, Vivian Demuth, Wanda Marrow Clevenger, Wilna Panagos, and Yossarian Hunter.